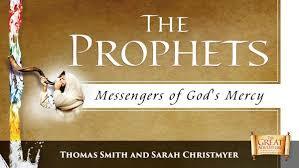 PROPHETS – Messengers of God’s Mercy by Thomas Smith is a Catholic Bible study that will draw you closer to God. The Prophets afflict the comfortable and comfort the afflicted, calling us to return to our covenant relationship with God. They urge us to repentance, warn us of the dangers of sin, and announce the blessings of faithfulness. Their prophetic words speak to us even today, as they draw us closer to God, and show us how to share him with others. The Prophets will help you discover the areas in your life that prevent you from drawing closer to God, and the ways you are called to be the voice of God to others. We hope you will be able to join Sr. Barbara Rund on Thursday mornings from 9:30-11:15 AM in Parish Hall B. To register for Prophets, please click here, or you may print a copy of the registration form and return to the Parish Office.